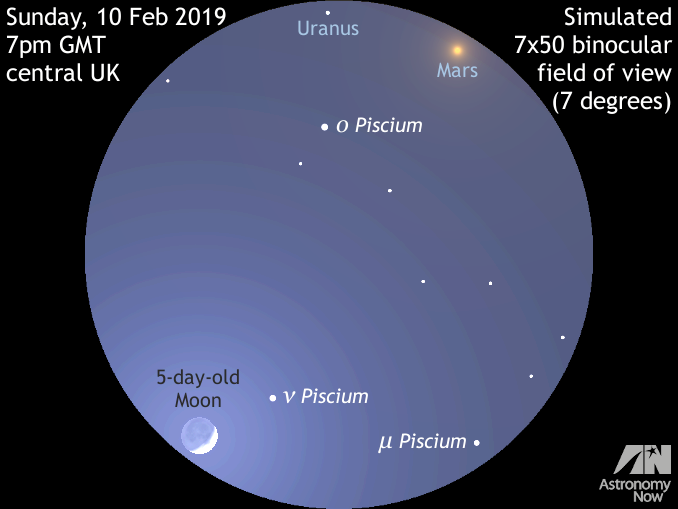 As night falls in the UK on 10 February, users of low-power wide-angle binoculars should look to the southeast to see the waxing 5-day-old crescent Moon, Mars and distant planet Uranus all in the same field of view. Magnitude +5.8 Uranus lies 1½ degrees above naked-eye star Omicron (ο) Piscium (magnitude +4.3) and slightly less than 2 degrees to the upper left of magnitude +1 Mars. Fainter field stars are shown to magnitude +6.6, including Nu (ν) Piscium and Mu (μ) Piscium, magnitudes +4.4 and +4.8, respectively. AN graphic by Ade Ashford. Have you ever seen Uranus? Currently shining at magnitude +5.8, the seventh planet is not that faint. In fact, if you’re particularly keen-sighted you can just see it with the naked eye when it lies highest in the southern sky on moonless nights away from light pollution. Uranus is an easy target in binoculars – if you know precisely where to look. If skies are clear in the UK and Western Europe in the early evening of Sunday, 10 February 2019 Uranus lies closely in the same line of sight as relatively nearby Mars and our own Moon, both acting as convenient celestial pointers to their distant planetary sibling. With a diameter four times that of the Earth, Uranus is the third largest planet in the solar system. It orbits the Sun once every 84 years at a mean distance of 2,875 million kilometres, or 19 times farther away from the Sun than Earth. Like its more distant ‘twin’ Neptune, Uranus is considered an ice giant because, while it is largely composed of hydrogen and helium gas like its larger kin Jupiter and Saturn, Uranus also contains methane gas plus water and ammonia in the form of ice. On the UK evening of 10 February, Uranus lies just under four lunar diameters (1° 51′, to be precise) to the east of the Red Planet. On this night Mars shines at magnitude +1.0 and sports a tiny gibbous disc just 5.8 arcseconds across owing to its distance of 241 million kilometres from Earth. Uranus is almost 7½ times the physical diameter of Mars, but lies 3,024 million kilometres from us on 10 February, hence the seventh planet appears just 3.4 arcseconds wide. The Moon – on our doorstep in comparison – is just 392,380 kilometres away this night. Put another way, the Red Planet is in excess of 600 times farther away than the Moon, while Uranus is 12½ times farther away than Mars! The Red Planet passes a shade under one degree (58½ arcminutes) north of Uranus around 05:40 UT on Wednesday, 13 February. Both planets appear against the constellation backdrop of Aries at the time, Mars being about 80 times brighter than its distant sibling. 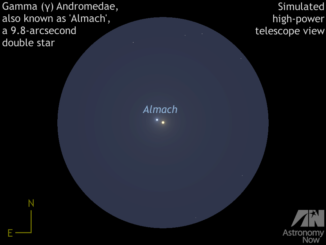 Now that the season of mists and mellow fruitfulness is upon us and the bright summer stars and planets are slipping away to the west, why not seek out some of the spectacular double stars of the autumn sky? We show you how to find some celestial gems suitable for small to medium telescopes in the constellations of Aquarius, Aries and Andromeda. 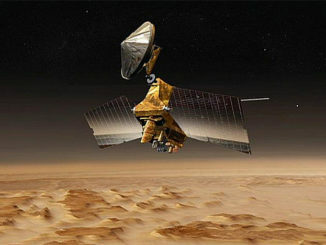 NASA is tweaking operating procedures to prolong the life of its Mars Reconnaissance Orbiter, reducing the demand on its batteries and switching to star trackers instead of aging gyroscopes to determine the spacecraft’s orientation. The Moon’s Orientale basin is an archetype of “multi-ring” basins found throughout the solar system. 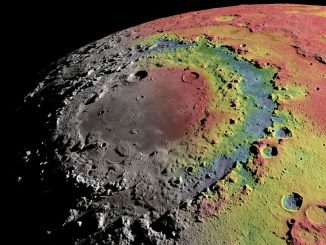 New research has enabled scientists to reconstruct Orientale’s formation using data from NASA’s GRAIL mission. It is now thought that the 580-mile-wide feature was created 3.8 billion years ago by an impacting object some 40 miles across travelling at about 9 miles per second.